The Supreme Court decision that property owners may be entitled to compensation for government regulations that deprive them of reasonable use of their property has thrown the land-use field into a state of turmoil. Will municipal land-use ordinances be found excessive? What regulations can be considered a reasonable exercise of police power for public health, safety, and welfare? Will municipalities be liable for compensation to property owners if development is restricted? How can municipalities and developers plan in the wake of this decision?Ordinance provisions cover components of subdivision regulation: general provisions, definitions, administration, procedure, design and improvements, off-tract improvements, and documents to be submitted. 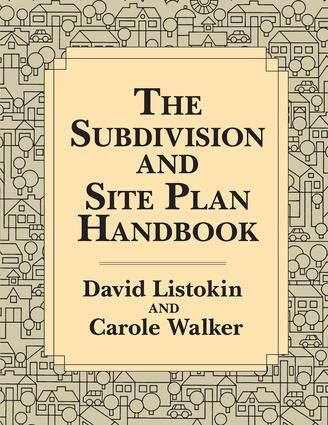 The Subdivision and Site Plan Handbook provides a narrative on the background, rationale, and intent of each requirement accompanying the model ordinance; gives an overview of the history of subdivision regulation in the United States; traces the evolution of land-use regulation through various stages; and presents the legal context for present-day regulation.The book has been designed for use by government administrators, developers, planners, attorneys, and others interested in land-use regulation. The model ordinance represents the most current thinking about land use and site control and responds to questions raised by the Supreme Court decision. David Listokin and Carole Walker's analyses are flexible, efficient, responsive to local conditions, and balance regulatory costs and benefits. This is a definitive and invaluable resource!